St Bride's, Gerinish, was opened in 1966. 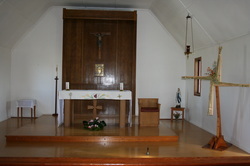 It is a simple 'chapel-of-ease' for Ardkenneth Parish. The Church bears the name of one of the patron saints of the Western Isles - St Bride. Inside the Church we have a large St Bride's Cross and artwork by our parish artist, Michael Gilfedder, depicting the Sacred Heart and the Blessed Virgin Mary.